The best way to get to know a community is by scheduling a tour. See the facilities, meet the staff and residents, and get a feel first hand what it's like to live at The Gardenias Assisted Living. Whether your loved one needs just a bit of help to remain independent or requires personalized memory care services to remain engaged with life, The Gardenias provides both services in a community that is designed to feel just like a home. In our beautiful, serene setting our residents discover a renewed lease of life because they live surrounded by friends and have numerous opportunities to socialize and work on beloved hobbies. 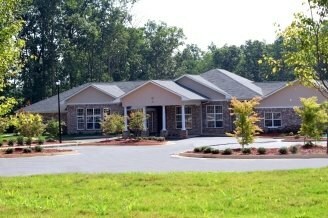 The Gardenias is an independently owned and operated senior living community in Hampton, Georgia. All our staff are well trained to care for the unique needs of seniors with Alzheimer's or dementia, and a registered nurse with more than 20 years of experience provides oversight. When your loved one joins our community, they can choose from a private or semiprivate suite. Each suite has views of our beautiful grounds, a private bathroom and plentiful storage for their personal belongings. We encourage families to bring personal treasures to decorate the space and make it feel like home. Families also appreciate knowing that with the emergency call system, help is always close at hand. At The Gardenias we offer home-cooked meals every day in our family-style dining room. And beverages are available throughout the day in the activity room. Whatever your loved one's interest, they will find something to fill their time, whether it is joining in a card game in the library or attending a worship service. Musical performances held in the lounge are another looked-forward to event. At The Gardenias, compassionate staff assume the chores and burdens of home maintenance and housekeeping. We are focused on providing wellness solutions to our residents so they can thrive and live a full life throughout their retirement. We are also there to assist with activities of daily living such as mobility, grooming, bathing and more. For our residents with Alzheimer's or dementia, we provide a safe, engaging setting that combines personalized care and engaging activities. All our staff are specially trained to care for seniors suffering from memory loss, and we find this makes all the difference in enhancing the lives of our residents. Assisted living and memory care services delivered with a dose of Southern hospitality is what families will find when they visit The Gardenias.